America Needs Tax Cuts and Tax Reform, but Can the GOP Deliver? It’s depressing to see how Republicans are bungling the Obamacare issue. But it’s also understandable since it’s politically difficult to reduce handouts once people get hooked on the heroin of government dependency (a point I made even before Obamacare was enacted). Unfortunately, I fear that the GOP might bungle the tax issue as well. I was interviewed the other day by Dana Loesch on this topic and highlighted several issues. High income tax rates on households are a big penalty on small businesses that pay through Schedule C of the personal income tax. Getting Republicans on the same page will be very difficult until the House GOP ditches the misguided border adjustment tax. Hong Kong shows that eliminating withholding would create a political environment conducive to limited government. What’s especially frustrating about this issue is that taxes should be reduced. A lot. Brian Riedl of the Manhattan Institute debunks six tax myths. Here they are, followed by my two cents. Brian nails it. I made this same point earlier this year. Indeed, because the tax burden is projected to automatically increase over time, it is accurate to say that more than 100 percent of the long-run fiscal problem is caused by excessive spending (particularly poorly designed entitlement programs). Once again, Brian is right. There are ways to significantly increase the tax burden in America, such as a value-added tax. But the class-warfare ideas that attract a lot of support on the left won’t raise much revenue because upper-income taxpayers have substantial control over the timing, level and composition of their income. Since even the IRS has admitted that upper-income taxpayers finance a hugely disproportionate share of the federal government, it hardly seems fair to subject them to even more onerous penalties. Especially since the IRS data from the 1980s suggest punitive rates could lead to less revenue rather than more. There are several ways to slice the data, so one can quibble with Brian’s assertion. But when comparing taxes paid by the rich compared to taxes paid by the poor, it is true that the United States relies more on upper-income taxpayers than any other developed nation. Not because we tax the rich more, but because we tax the poor less. Brian is right. Child credits, changes in the standard deduction and personal exemptions, and the EITC have combined in recent decades to take millions of households off the tax rolls. And since the U.S. thankfully does not have a value-added tax, lower-income people are largely protected from taxation. There are many factors that determine a nation’s economic success, including trade policy, regulation, monetary policy, and rule of law, so a good tax code isn’t a guarantor of prosperity and a bad tax system doesn’t automatically mean malaise. But Brian is right that taxation has a significant impact on growth. In the interview, I said that I had two fantasies. First, I want to junk the corrupt internal revenue code and replace it with a simple and fair flat tax. Second, I’d ultimately like to shrink government so much that we could eliminate the income tax entirely. 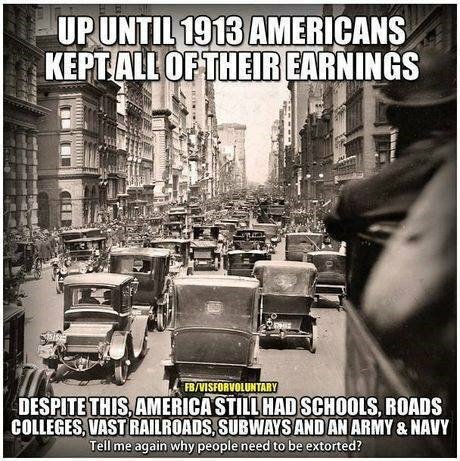 Many people don’t realize that income taxes only began to plague the world about 100 years ago. If we can somehow restore the kind of limited government envisioned by America’s Founders, the dream of no income tax could become a reality once again. But if Republicans can’t even manage to cut taxes today, when they control both the executive and legislative branch, then neither one of my fantasies will ever become reality. Dan Mitchell, I agree with you here. However, liberal/progressive/socialist types don’t seem to understand this at all. You’re asking the wrong question. It isn’t “can they deliver,” but “will they deliver”? They certainly can deliver, if they put aside their own hatred and loathing of Donald Trump, but enough Repubs are NeverTrumpers first that they’d scream bloody murder if he told them the sky is blue. READERS: This point is absolutely critical. Taxpayers today had been Progressively reduced down to constitute only about 48% of the total population. Also, the distribution of that total has an even smaller group paying the lion’s share of the total tax. The President’s and GOP tax proposals would double the Standard Deduction. GOP healthcare proposals would add a new Refundable Tax Credit to help people by health insurance. The President is now floating a higher (40+%) tax rate on the wealthy. All of these GOP proposals continue the INSANITY of shrink the tax base down to (maybe) 40%+/- (with an even smaller group paying most of the tax). At that point, taxpayers will be an indefensible, irreversible MINORITY that will be perpetually squeezed by Congress until Atlas Shrugs. Sure, the caveman with the biggest club could enslave others or seize their production. So could feudal lords. So what? That changes Dan’s point not one iota. Government does not need to be Big to help us avoid enslavement or seizure of production. Which means Taxes also do not need to be Big. Yes, but pre-modern societies imposed onerous burdens on most residents like forced labor and seizure of production. The great majority of people in DC (Cato excepted) would rather gouge out their own eyes than reduce tax rates.